When you are newly entering the world of figure skating there’s no doubt it can be overwhelming. You find yourself googling “figure skating for parents and what you need to know.” Parents with a child in figure skating who is just starting out may have a lot of questions. Where should your child take lessons? What kind of skates should your child be wearing? What will all of this cost me? How can you help your child succeed? There is no denying that figure skating is a demanding sport. So to help you in this new competitive world, we have created the ultimate guide to figure skating for kids. We’ll help you understand terminology, training, levels of skating, and the time commitments needed. Use this guide as a way to figure out how to navigate the figure skating world like a pro. Figure skating is a sport with many dimensions and disciplines such as singles freestyle, pairs freestyle, dance, and more. Most young figure skaters starting out will begin in a group lesson environment. Most rinks will teach the basic skills from USFSA’s Learn-To-Skate program throughout the year. These classes usually involve skating once a week for 30 to 45 minutes with a group and instructor, and additional practice time outside of class. These classes are a good cost-efficient way to help your child learn to skate. Once your child has gone through all of the basic skills classes, this will usually be the time that they may join a skating club and hire a private instructor. Most skating clubs require that the skater has passed through, or has demonstrated capability in all of the skills through the basic skills program. As your child becomes a more skilled skater, they will most likely want to start competing in the sport. Your coach may use terms such as “moves in the field” or “pre-preliminary” and you have no idea what he or she is talking about. These terms refer to the test structure of U.S. Figure Skating, and it may seem confusing, but will soon be an integral part of your figure skating vocabulary. These tests are a part of the national standard that skaters are measured against in figure skating. They are more formal than the Basic Skills testing and are usually performed in front of a judge rather than just in front of the skater’s instructor. A skater’s competition level in each of these disciplines is determined by the highest test level they have passed. Skating sessions at rinks, camps, and clinics are also often divided by test level. An athlete will typically start with a Moves in the Field track as it is often a prerequisite for tests in other disciplines. For example, in order to take a test in free skating, the skater must past the equivalent test for Moves in the Field. Each level builds off of the one before it. There is no correct amount of time that it should take to progress through these skills. Every skater is different and will progress in their own time. Moves in the Field tests are some of the most important to master in order to be a successful figure skater. They focus on posture, accuracy, strength, power, execution, and more. Free skate is very similar in the fact that each time you progress, more challenging and intricate skills are layered on. In free skate, you are also judged on presentation, and that while there are many skills that are common in each level, it is expected that the skater will perform them at a higher quality and skill than the previous level. Each skater has a unique style of training and progresses at a different pace. While training is important, there is no right or wrong amount of time to spend on each level or skating. Typically, competitive skaters will spend anywhere from 1-15 hours a week on the ice depending on level of interest, competitiveness, and budget. The more ice and instructional time, the more it will cost, so your budget will play a factor in how quickly they are able to progress, as well. 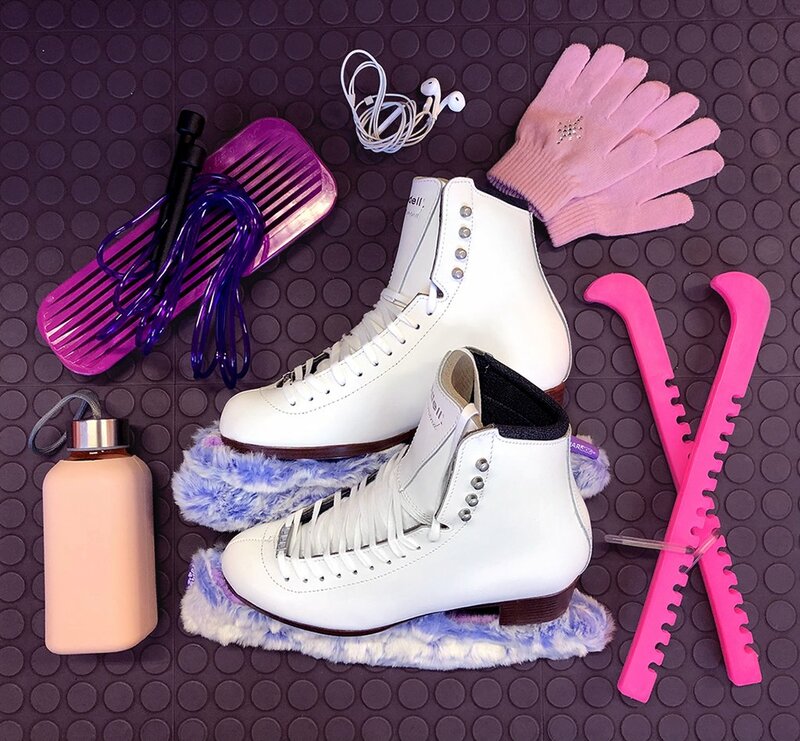 Other aspects to your budget you may want to take into consideration are costumes, extra ice time, skates and blades, travel, competition fees, and more. Investing in high-quality skates will help keep your skater’s feet happy and less likely to injure themselves on the ice. One of the most important parts of being a skating parent is remembering that your skater is a person first, skater second. It is likely that your skater is still growing and maturing. They still need time for other activities outside the rink. Making sure there is balance in your skater’s life will help them with the stress and pressure of the sport. Here are some tips to take into consideration as a parent to help your young skater succeed. Help them set realistic goals. Goals give them something to work towards, but if they are unachievable at the rate they are progressing they can get discouraged. Make sure the goals are challenging but manageable. Learn as much about the sport as you can. Knowing the basics of figure skating will not only help you understand what your child’s coach is teaching them, but shows you are interested in understanding the elements and helping them succeed. Be a good sport. This is important because children see what adults do, and if you are congratulating another skater for doing a job well done, then your child will mimic that behavior and learn to treat other skaters with respect. Watch and support your skater. Watching their practice helps you learn more about what they are being taught. Praise them for jobs well done, and also acknowledge when there are areas that might need work. Navigating the figure skating world can seem like a huge challenge, but finding the right skates doesn’t have to be. Customize your skates with Riedell. Having custom-fitted figure skates will give your skater the best support and comfort for his or her unique feet. With over 65 years dedicated to researching and creating the best figure skating boots possible, Riedell can help you find the ideal figure skates that are right for your growing skater.